Drunken Hearted Man Is A Great "How-To" Blues Guitar Lesson. It includes a free fingerstyle guitar tab. The fingerstyle guitar tabs will show his approach to both accompaniement chords and instrumental breaks. One of the most unusual things that you'll in the fingerstyle guitar tabs are some of the chords that he uses. They may not look familiar at first because they've been reduced to their most basic form. An example of this is the G chord found in measure 8. It is broken down into a G triad (look at the page on Guitar Chord Construction for a refresher course). In fact, in parts of the accompaniement, he's only playing 2 of the 3 notes in the triad. Other unsual chords used in this blues guitar lesson are the D Major and D diminished chords that are used. While there's nothing unusal in a D Major or D diminished chord, the way that he fingers them in this song is different. The D major is played on strings 2, 3, and 4. On the turnaround the same form is played but it also uses a high A on the 5th fret of the 1st string. Next he lowers everything in the chord except the root (2nd string, 3rd fret) to produce the D diminished. It's a pretty cool move that makes for a pretty cool sound. The free guitar tab that's included with the lesson shows the intro, outro and all of the little fills between the verses. This is a pretty easy song to play. The video and fingerstyle guitar tablature in this blues guitar lesson will get you started. Of course, the more that you listen to the original recording the better. Repeated listening will help you develop a feel for the phrasing and timing. If you would like to find out more about Robert Johnson, visit his Ofiicial Website. Click this link to get the tab. 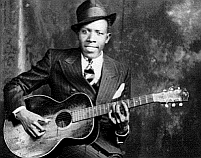 Ready for more Robert Johnson? Do you subscribe to Fingerstyle Monthly? It's free and easy to do. Check out some Back Issues! 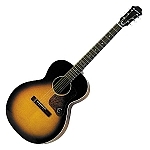 Ready for more Acoustic Blues Guitar Lessons?